A giant pair of films are about to be unleashed upon theater screens around the world. Attack on Titan, a film so big, it had to be split into two parts in order to sufficiently tell its tale, continues the tradition of colossal creatures decimating the human population. Based on a popular Japanese manga series of comics, this unrated live action version promises to be gruesome and gory on a grand scale. 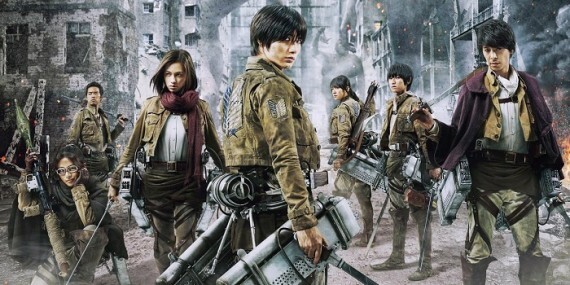 Attack on Titan tells the story of mankind forced to live behind giant walls which keep out enormous humanoid-looking monsters who have destroyed much of the world populace with their proclivity for human flesh. 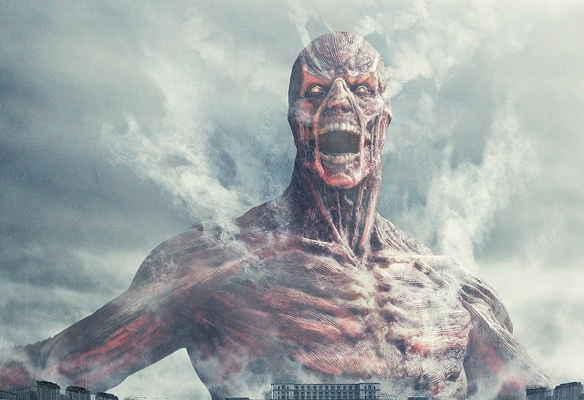 Now, after relative peace for over 100 years, an overly massive Titan has broken through one of the walls, and as other Titans breach its perimeter, the last of humanity must soldier up and fight back against these seemingly indestructible beasts. The film, coming from Japan’s legendary Toho Company, the studio behind Godzilla, Mothra and countless other rampaging behemoths, is being given a unique release pattern by distributor, FUNinamtion Entertainment. Part 1 will be released in select U.S. theaters for a very limited engagement on Sept. 30, while Part 2 will get the same treatment beginning on Oct. 20. Already released in Japan, Australia and other countries, the film is directed by Shinji Higuchi, who is currently finishing work on Toho’s upcoming Godzilla reboot, set for release next year. Higuchi has plenty of experience in dealing with humongous creatures, having served as special effects director for the series of Gamera films in the 90s.